Died : Lyons, 15 July, 1274. Nothing is known of Bonaventure's parents save their names: Giovanni di Fidanza and Maria Ritella. How his baptismal name of John came to be changed to that of Bonaventure is not clear. An attempt has been made to trace the latter name to the exclamation of St. Francis, O buona ventura, when Bonaventure was brought as an infant to him to be cured of a dangerous illness. This derivation is highly improbable; it seems based on a late fifteenth-century legend. Bonaventure himself tells us (Legenda S. Francisci Prolog.) that while yet a child he was preserved from death through the intercession of St. Francis, but there is no evidence that this cure took place during the lifetime of St. Francis or that the name Bonaventure originated in any prophetical words of St. Francis. It was certainly borne by others before the Seraphic Doctor. No details of Bonaventure's youth have been preserved. He entered the Order of Friars Minor in 1238 or 1243; the exact year is uncertain. Wadding and the Bollandists bold for the later date, but the earlier one is supported by Sbaradea, Bonelli, Panfilo da Magliano, and Jeiler, and appears more probable. It is certain that Bonaventure was sent from the Roman Province, to which he belonged, to complete his studies at the University of Paris under Alexander of Hales, the great founder of the Franciscan School. The latter died in 1246, according to the opinion generally received, though not yet definitely established, and Bonaventure seems to have become his pupil about 1242. 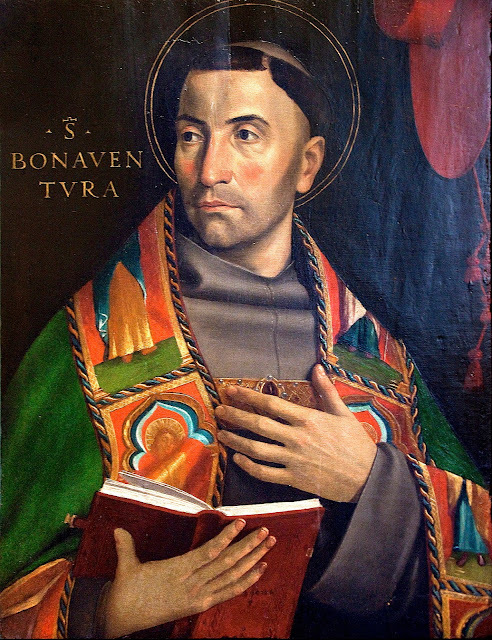 Be this as it may, Bonaventure received in 1248 the "licentiate" which gave him the right to teach publicly as Magister regens, and he continued to lecture at the university with great success until 1256, when he was compelled to discontinue, owing to the then violent outburst of opposition to the Mendicant orders on the part of the secular professors at the university. The latter, jealous, as it seems, of the academic successes of the Dominicans and Franciscans, sought to exclude them from teaching publicly. The smouldering elements of discord had been fanned into a flame in 1256, when Guillaume de Saint-Amour published a work entitled "The Perils of the Last Times", in which he attacked the Friars with great bitterness. It was in connexion with this dispute that Bonaventure wrote his treatise, "De paupertate Christi". It was not, however, Bonaventure, as some have erroneously stated, but Blessed John of Parma, who appeared before Alexander IV at Anagni to defend the Franciscans against their adversary. The Holy See having, as is well known, re-established the Mendicants in all their privileges, and Saint-Amour's book having been formally condemned, the degree of Doctor was solemnly bestowed on St. Bonaventure and St. Thomas Aquinas at the university, 23 October, 1257. In the meantime Bonaventure, though not yet thirty-six years old, had on 2 February, 1257, been elected Minister General of the Friars Minor — an office of peculiar difficulty, owing to the fact that the order was distracted by internal dissensions between the two factions among the Friars designated respectively the Spirituales and the Relaxati. The former insisted upon the literal observance of the original Rule, especially in regard to poverty, while the latter wished to introduce innovations and mitigations. This lamentable controversy had moreover been aggravated by the enthusiasm with which many of the "Spiritual" Friars had adopted the doctrines connected with the name of Abbot Joachim of Floris and set forth in the so-called "Evangelium aeternum". The introduction to this pernicious book, which proclaimed the approaching dispensation of the Spirit that was to replace the Law of Christ, was falsely attributed to Bl. John of Parma, who in 1267 had retired from the government of the order in favour of Bonaventure. The new general lost no time in striking vigorously at both extremes within the order. On the one hand, he proceeded against several of the Joachimite "Spirituals" as heretics before an ecclesiastical tribunal at Città della Pieve; two of their leaders were condemned to perpetual imprisonment, and John of Parma was only saved from a like fate through the personal intervention of Cardinal Ottoboni, afterwards Adrian V.
On the other hand, Bonaventure had, in an encyclical letter issued immediately after his election, outlined a programme for the reformation of the Relaxati. These reforms he sought to enforce three years later at the General Chapter of Narbonne when the constitutions of the order which he had revised were promulgated anew. These so-called "Constitutiones Narbonenses" are distributed under twelve heads, corresponding to the twelve chapters of the Rule, of which they form an enlightened and prudent exposition, and are of capital importance in the history of Franciscan legislation. The chapter which issued this code of laws requested Bonaventure to write a "legend" or life of St. Francis which should supersede those then in circulation. This was in 1260. Three years later Bonaventure, having in the meantime visited a great part of the order, and having assisted at the dedication of the chapel on La Verna and at the translation of the remains of St. Clare and of St. Anthony, convoked a general chapter of the order of Pisa at which his newly composed life of St. Francis was officially approved as the standard biography of the saint to the exclusion of all others. At this chapter of 1263, Bonaventure fixed the limits of the different provinces of the order and, among other ordinances, prescribed that at nightfall a bell should be rung in honour of the Annunciation, a pious practice from which the Angelus seems to have originated. There are no grounds, however, for the assertion that Bonaventure in this chapter prescribed the celebration of the feast of the Immaculate Conception in the order. In 1264, at the earnest request of Cardinal Cajetan, Bonaventure consented to resume the direction of the Poor Clares which the Chapter of Pisa had entirely renounced the year before. He required the Clares, however, to acknowledge occasionally in writing that the favours tendered them by the Friars were voluntary acts of charity not arising from any obligation whatsoever. It is said that Pope Urban IV acted at Bonaventure's suggestion in attempting to establish uniformity of observance throughout all the monasteries of Clares. About this time (1264) Bonaventure founded at Rome the Society of the Gonfalone in honour of the Blessed Virgin which, if not the first confraternity instituted in the Church, as some have claimed, was certainly one of the earliest. In 1265 Clement IV, by a Bull dated 23 November, nominated Bonaventure to the vacant Archbishopric of York, but the saint, in keeping with his singular humility, steadfastly refused this honour and the pope yielded. In 1266 Bonaventure convened a general chapter in Paris at which, besides other enactments, it was decreed that all the "legends" of St. Francis written before that of Bonaventure should be forthwith destroyed, just as the Chapter of Narbonne had in 1260 ordered the destruction of all constitutions before those then enacted. This decree has excited much hostile criticism. Some would fain see in it a deliberate attempt on Bonaventure's part to close the primitive sources of Franciscan history, to suppress the real Francis, and substitute a counterfeit in his stead. Others, however, regard the decree in question as a purely liturgical ordinance intended to secure uniformity in the choir "legends". Between these two conflicting opinions the truth seems to be that this edict was nothing more than another heroic attempt to wipe out the old quarrels and start afresh. One cannot but regret the circumstances of this decree, but when it is recalled that the appeal of the contending parties was ever to the words and actions of St. Francis as recorded in the earlier "legends", it would be unjust to accuse the chapter of "literary vandalism" in seeking to proscribe the latter. We have no details of Bonaventure's life between 1266 and 1269.